In my copy the titles of the discourses are capitalized and include italics so I have tried to reproduce them here as printed. They are also, of course, quotations taken from the scripture. This is a brand new translation by Bruce H. Kirmmse, just published in 2016. Kierkegaard was specific in calling these writings discourses, and distinguished them from his more scholarly philosophical writings. So it might not hurt to get a little more clear on what, in the literary world, a discourse is. A later philosopher, Michel Foucault, defines discourse as: “Systems of thoughts composed of ideas, attitudes, and courses of action, beliefs and practices that systematically construct the subjects and the worlds of which they speak.” Well that is pretty technical, but it comes close to capturing the kind of writing we find in Bird and Lily. However I think Kierkegaard would take issue with the idea that he is constructing either the subject or the world he is writing about. He would probably say he is employing the imperfect tool of language to get at something that not only pre-exists language but will exist long after human language has passed from use. It is amazing how much Kierkegaard can write on the subject of silence. And yet the book somehow doesn’t seem boring or even annoyingly repetitive; rather it is lulling, peaceful, and meditative. As I read the words I received their messages not once and for all, but once and then gradually on a successively deeper level. I wish I had an audio version because I think this book would work well as a guided meditation. I’d love to hear someone with a rich sonorous voice read it to me as I lay with my eyes closed in a dim room. Candles would work too. The third discourse is the shortest and the one I enjoyed the most. It is about learning to be fully present in the joy of moment, not worrying about what will happen tomorrow. Kierkegaard writes that the joy of the lily and the bird is not because they are free of suffering. They do suffer. All of nature withers and perishes. They simply live in the eternal moment fully experiencing the gift of existence, casting their sorrow upon God. Sketch of Søren Kierkegaard. Based on a sketch by Niels Christian Kierkegaard (1806-1882). I am only starting my study of Kierkegaard, so I am no expert. With The Lily of the Field and the Bird Of The Air, I know I have only dipped my index finger into the vast and deep sea of Kierkegaard. I see that he writes about the things that most interest me in the universe, so I am very excited about continuing my study. What I understand, from this book and my background research, is that Kierkegaard explores the nature of human existence––what human beings really are in body, mind, and soul in the larger scheme of the universe. Considered the first existentialist philosopher, he wrote in first half to middle years of the great 19th century and was influenced by the Romantic movement. I get the impression he was one of those lone meteoric philosophers who do not fit neatly into the going school or cultural movement. 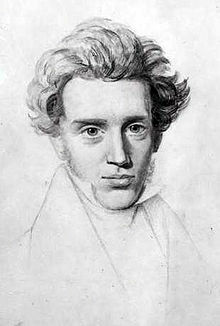 Kierkegaard wrote both “aesthetic” or scholarly philosophy, often using pseudonyms, as well as more overtly religious “discourses” such as Bird and Lily. He liked to write both types of books as companion pieces, looking at the same subject from different perspectives. In the introduction of this book Bruce H. Kirmmse explains that Kierkegaard liked to say he offered his aesthetic writing with his left hand and his religious discourses with his right. The aesthetic companion to Bird and Lily is the second edition of Either/Or. So Either/Or is the next Kierkegaard on my list. 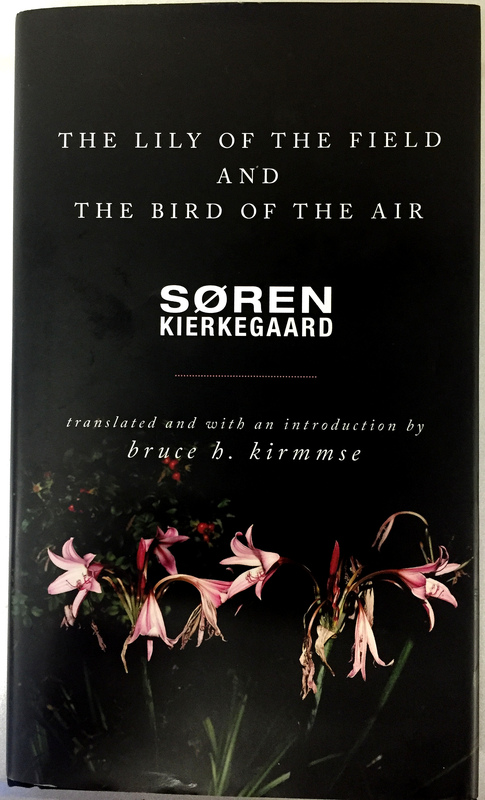 Posted on July 1, 2016, in Book reviews, Classics, Philosophy and tagged Bruce H. Kirmmse, Classics Review: The Lily of the Field and the Bird of the Air by Søren Kierkegaard, do not worry about the morrow, kierkegaard religious discourses, lily of the field verse, Matthew 6:24-34, no one can serve two masters, soren kierkegaard kirmmse translation. Bookmark the permalink. Leave a comment.